Child‘s voice is an angel’s voice. Mamta Children's Hospital and NITY NICU HOPITAL is a specialist pediatric center providing a full range of clinical services, tertiary care and health promotion and prevention programs for children and adolescents. With constant care, “NITY” and with a dedicated team of doctors and hospital staff we believe we can “Make Miracles Happen” and at a cost affordable to the people. Mamta Hospital NITY NICU, Ankleshwar is a 45 bedded Pediatric Hospital in the heart of Ankleshwar. We have state of the art modern infrastructure and we bring the best health care for your child right from the first breath, infancy and beyond. We have the first certified Neonatologist of Bharuch, aiming to provide the best Neonatal care round the clock. Backed up by super specialist services , latest equipments and super specialists’ consultations on weekly basis. We provide a homely ambience and treat the kids as our own. “Mamta” is our motto and a constant smile for your baby is what we work for. With constant care “NITY” and with a dedicated team of doctors and hospital Staff we believe we can “Make Miracles Happen” and at a cost affordable to the people. Mamta Hospital has a LEVEL III NICU, Pediatric Critical Care Unit, Pediatric Operation Theatre, Mamta Vaccination Centre, Mamta Diagnostic Laboratory, Mamta X-ray Department, Emergency room and Ambulance Services to care for children round the clock. We update at regular intervals and bring the best for your child and you. With time Mamta Hospital has grown from a 5 bedded rented flat to 45 bedded pediatric multi specialty hospital and we are firm at maintaining the quality of health care for your lovely child. ours has 24 hour emergency service, equipped to handle all types of pediatric medical l emergencies including respiratory failure, infectious diseases, injuries, poisonings, seizures, asthma, acute abdomen and newborn surgical problems. For our sick children, we provide round the clock services including emergencies and intensive care. Mamta Hospital NITY NICU, is a 45 bedded Pediatric Hospital in the heart of Ankleshwar. We have the first certified Neonatologist of Bharuch, aiming to provide the best Neonatal care round the clock. Mamta means ‘loving and caring’ and true to the name we take care of every child and new born babies with “MAMTA” and affection. Prompt diagnosis and treatment in a comfortable environment is what I believe every child deserves. With the vision to providing best health to the child I started off a small consultation in 1982 in a humble way with 5 beds and an incubator. With time I expanded to a 17 bedded facility. I have always dreamt of a pediatric multispecialty hospital and see my dream come true with this 45 bedded facility with ultra- modern equipments at Ankleshwar. 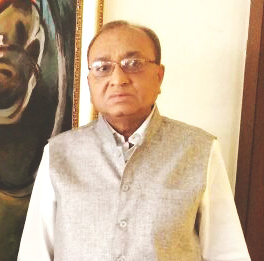 I am in this venture by my son Dr. Niraj Gupta together we form a formidable pair in managing the day-to-day affairs of the hospital and most importantly serving children and new born babies with utmost care and medical attention. 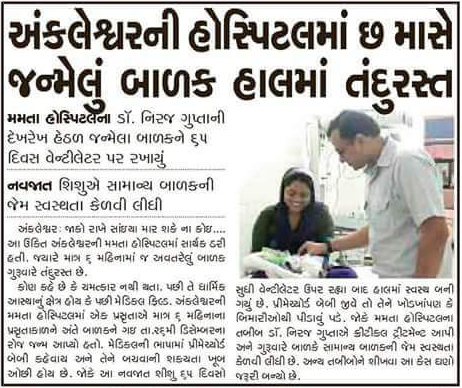 Dr. Niraj has done his initial Pediatric training at Dhiraj hospital, Baroda. 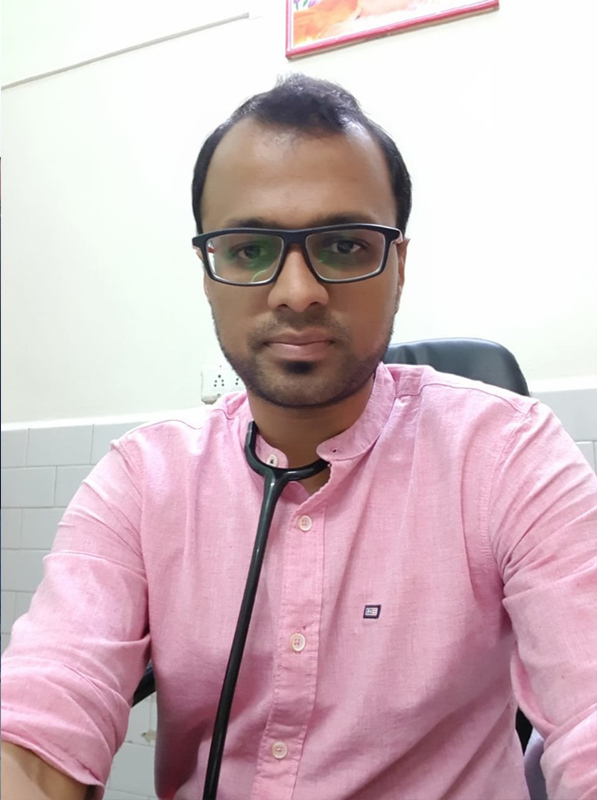 He has done Fellowship in Neonatology (FNNF) at Nirmal Hospital. He has extensive training and experience and is backed by qualified medical staff and modern medical facilities including Neonatal Intensive Care Units (NICU) which help them provide comprehensive care for infants.